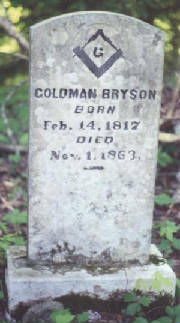 During the Civil War, Captain Goldman Bryson's Union Volunteers had many names and designations, including Bryson's Federal Company of Raiders, The Bryson Gang, Union First Tennessee National Guard, Bryson Gang of Western North Carolina, Bryson's Bushwhackers, and Bryson's East Tennessee Volunteers. The U.S. Senate, however, would officially recognize the unit as Captain Goldman Bryson's Mounted Company. Captain Goldman Bryson's Federal Mounted Company, or so-called “Mountain Robbers,” was an estimated force of 120-150 troops and during the Civil War it raided numerous Western North Carolina communities. The unit warranted tremendous hatred for several reasons. On August 31, 1856, Goldman Bryson was implicated in the murder of John Timson, a Cherokee constitutional convention delegate that resided in Cherokee County. Goldman's brother and sister testified and provided Goldman's alibi and, because his accuser was a mixed-blood Cherokee, the murder charge was dismissed. Cherokee intermarriage, with whites, was most characteristic along the Valley River, near Murphy, Cherokee County. Although Goldman was acquitted of murder, many Cherokee County residents viewed him as a murderer. Bryson was born in Haywood County, in Western North Carolina, and during the Civil War he terrorized the very people, kindred, and communities that once loved him, thus epitomizing the “brother killing brother” during the war. Goldman Bryson is related to Colonel Thaddeus Bryson, one of the founders of Bryson City, in Western North Carolina (Bryson City, through the years, had been referred to as Tuckoritchie, Tuckaleechy Town, Big Bear’s Reserve, and Charleston). Hence, the Western Carolinians referred to Goldman as a “Home Yankee.” The ominous maelstrom awaiting the Bryson Troops climaxed with its last raid on the town called Murphy, in familiar Cherokee County. Goldman and his tories entered the city, arrogantly marched the streets, and then sacked the town. Now, the Cherokees, Western North Carolinians, General Braxton Bragg, Governor Zebulon Vance, and Thomas’ Legion were steadfast in their determination to eradicate the Bryson Gang and finally halt these egregious and deplorable acts. Without stopping or eating, the Cherokees of Thomas’ Legion tracked the “gang” for two days. When the Cherokees located Goldman Bryson, Lt. C. H. Taylor, a Cherokee, demanded Goldman Bryson to halt, he refused, and then Lt. Taylor shot him. Bryson ran and was shot several more times. Next, the Cherokees wore Goldman's bloody clothes and proceeded through the streets of Murphy. General Braxton Bragg and Governor Zebulon Vance publicly applauded and congratulated Thomas’ Legion for exterminating “Goldman and his Robbers.” It was rare to be recommended by name to one of the eight generals in the Confederate States Army, and Lt. Campbell H. Taylor received that honor when he was commended to General Braxton Bragg. There were four general grades in the Confederate States Army: brigadier-general, major-general, lieutenant-general, and general being the highest attainable rank. However, during informal communication each may be addressed as general. Report of Lieut. C. H. Taylor: Thomas’ Legion C. S. Army. Sir: on October 27, General Vaughn, with a detachment of his mounted men, overtook Goldman Bryson, with his company of mounted robbers, in Cherokee County, N.C., attacked him, killing 2 and capturing 17 men and 30 horses. On the 28th, I left Murphy with 19 men, taking Bryson’s trail through the mountains; followed him 25 miles, when I came upon him and fired on him, killing him and capturing 1 man with him. I found in his possession his orders from General Burnside and his roll and other papers. My men all acted nobly; marched two days, and without anything to eat. Special Field Orders, No. 56: HDQRS. Army of the Ohio: Knoxville, East Tenn., October, 22, 1863. VI. Capt. G. Bryson, First Tennessee National Guard, is hereby ordered to proceed with his command to North Carolina and vicinity, for the purpose of recruiting, and will return here within a fortnight, when he will report in person at these headquarters. Permit me, general, to recommend to your notice C. H. Taylor, lieutenant, who commanded the Indians at the killing of Captain Bryson. You will pardon me, general, in not sending this through the proper channel, we have no mails. Bills and Resolutions, House of Representatives, 40th Congress, 3rd Session, Read the first and second times. An Act Providing for the payment of Captain Goldman Bryson's mounted company. Read the first and second times. An Act Providing for the payment of Captain Goldman Bryson's mounted company. Sources: Official Records of the Union and Confederate Armies; Vernon H. Crow, Storm in the Mountains: Thomas' Confederate Legion of Cherokee Indians and Mountaineers; Vernon H. Crow, The Justness of Our Cause; Walter Clark, Histories of the Several Regiments and Battalions from North Carolina in the Great War 1861-1865; Weymouth T. Jordan and Louis H. Manarin, North Carolina Troops, 1861-1865; E. Stanly Godbolt, Jr. and Mattie U. Russell, Confederate Colonel and Cherokee Chief: The Life of William Holland Thomas; The Civil War Diary of William W. Stringfield, Johnson City, TN: East Tennessee Historical Society Publications; John H. Stewart Papers (Private Collection); The Thomas Legion Papers (thomaslegion.net/papers.html); D. H. Hill, Confederate Military History Of North Carolina: North Carolina In The Civil War, 1861-1865; and Library of Congress.